SanDisk's 64-layer 3D TLC NAND is nearing the end of its product cycle, but they and other NAND flash manufacturers aren't in a hurry to switch over to 96L NAND, so it's not quite time for another straightforward refresh of the WD Blue. Instead, Western Digital has chosen to migrate the WD Blue brand over to a different market segment. Now that the WD Black is well-established as a high-end NVMe product, there's room for an entry-level NVMe SSD, and it will be the new WD Blue SN500. This is little more than a re-branding of an existing OEM product (WD SN520), in the same way that the current WD Black SN750 SSD is based on the WD SN720. The SN520 was announced more than a year ago, but as an OEM product we were unable to obtain a review sample. Like the high-end SN720 and SN750, the SN520 and WD Blue SN500 use Western Digital's in-house NVMe SSD controller architecture, albeit in a cut-down implementation with just two PCIe lanes and no DRAM interface. The high-end version of this controller architecture has proven to be very competitive (especially for a first-generation product), but so far we have only the SN500's spec sheet by which to judge the low-end controller. High-end client/consumer NVMe SSDs all use PCIe 3.0 x4 interfaces, but the entry-level NVMe market is split between four-lane and two-lane controllers. Two-lane controllers are generally cheaper and their smaller size makes them attractive for small form factor devices that can't fit a full 22x80mm M.2 card. The WD SN520 is a 22x30mm design that is also available in 42mm and 80mm card lengths, but the retail WD Blue SN500 will only be sold in the 80mm length that is most common for consumer M.2 drives. The switch from SATA to NVMe means the new WD Blue SN500 will offer much higher peak performance, but the use of a DRAMless controller means there may be some corner cases where heavy workloads show little improvement or even regress in performance. The SN500's controller does not use the NVMe Host Memory Buffer, but does include an undisclosed amount of memory on-board that serves a similar purpose. This means that omitting the external DRAM from the drive should not have as severe a performance impact as it does for DRAMless SATA drives like the WD Green SSD. Even if the new WD Blue SN500 succeeds at offering far better performance than the current WD Blue SATA SSD, it will still be a big step backward in terms of capacity: the SATA product line ranges from 250GB to 2TB, but the SN500 will only be offered in 250GB and 500GB capacities. We hope that Western Digital has an upgraded WD Green in the works to keep affordable 1TB+ drives in their portfolio. 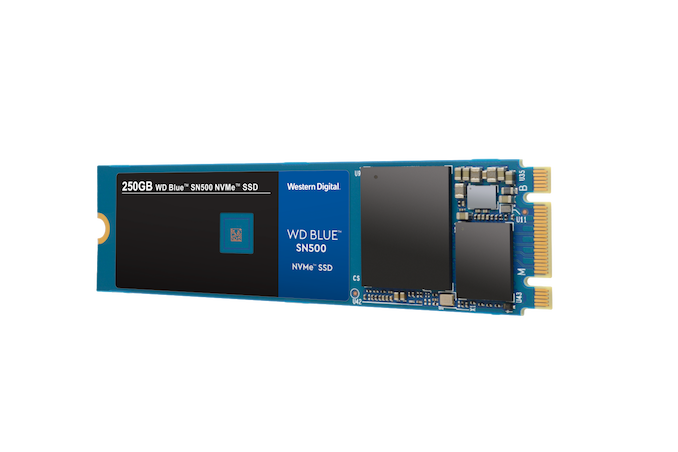 The MSRPs for the WD Blue SN500 are a few dollars higher than current retail pricing for the mainstream SATA SSDs they are intended to succeed. Western Digital has not mentioned when the SN500 will hit the shelves, but there will probably not be much delay after today's announcement, since this hardware has been shipping to OEMs for a year already. "well, for 'half-spec' NVME speeds and still 3x SATA spec, it's pretty darn inexpensive... Now we need mainboards to have 6x NVME slots instead of 6x SATA ports." I guess the controller would include a certain amount of RAM, more likely static because it takes an IBM p-Series CPU to mix DRAM and logic on a single die. I guess there could in fact be a PoP RAM chip and we couldn't tell from looking at the plastic housing, but could they afford that? That leaves embedded MRAM or ReRAM which I believe WD is working on, but would it already be included on this chip? And I wonder if a HMB-less design can actually be verified or where and how you can see what amount of host memory is actually being requested by an NVMe drive.